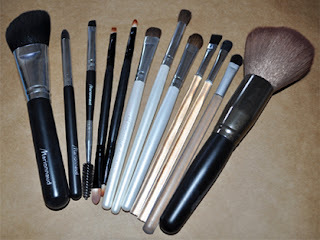 Random Beauty by Hollie: Makeup Brushes anyone ??? These are Random brushes I picked from Watsons and Metro Ayala Cebu. The first three brush are from Marionnaud (awesome brushes!!! ), the next two are dual tip generic brushes, then followed by three ELF brushes, the next three are from Watsons and Lastly my one and only generic powder brush which I picked at Metro Ayala and I bought it for only Php 119.75. The powder brush is definitely a worth it! I hope you got some inspiration from all of this.